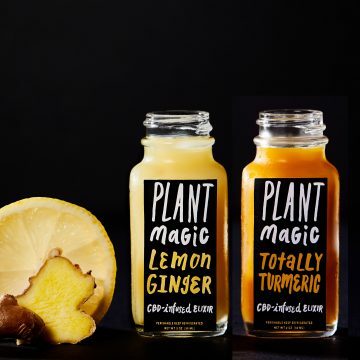 With great anticipation and a touch of mystique we are thrilled to release two elixirs from our upcoming new product line, Plant Magic ~ the Bay Area's newest line of juices and elixirs infused with hemp extract. First release flavors include Lemon Ginger and Totally Turmeric each served in 2 oz "shot size" bottles. CAN CAN Cleanse has been serving up the power of plants to customers for almost 10 years, and we believe that combining hemp-derived cannabidiol into our nutrient dense vegetable and fruit juices is a perfect pairing. Each 2oz elixir contains 15mg of hemp extract ~ a non-psychoactive plant-based wonder. Plant Magic is infused with hemp sourced from Colorado and formulated by Bay Area nano-emulsion experts. Our elixirs have been lab tested and verified to contain 15mg of hemp extract. Plant Magic is currently available exclusively at our SF shop and here on our website.